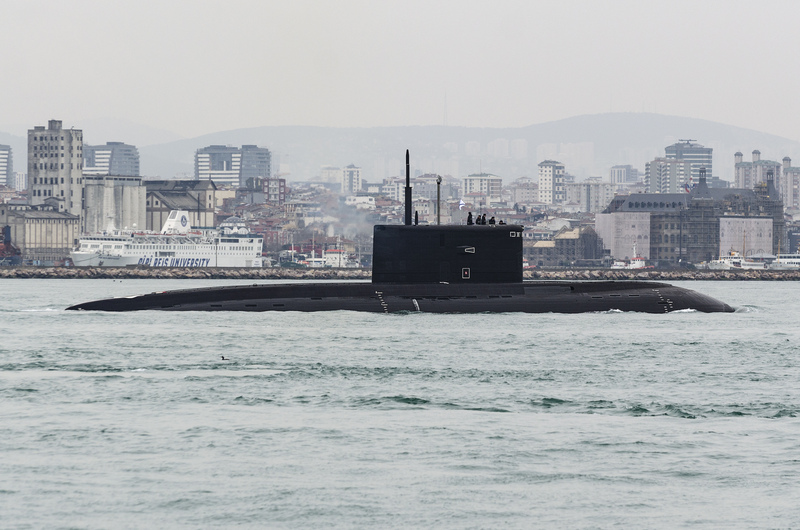 ISTANBUL – The Russian Improved Kilo-class submarine Krasnodar (B-265) made an unexpected southbound passage through the Bosphorus Strait on Thursday. The submarine assigned to the Black Sea Fleet entered the Mediterranean the next day. Under the Montreux Convention rules governing warships in the Black Sea, there are specific restrictions around passage in and out of the Black Sea, including by submarines. While the submarines of non-Black Sea nations are forbidden to pass through the Straits, the submarines of Black Sea riparian states may pass through the Turkish Straits – but only if they are passing through for the purpose of joining a base in the Black Sea for the first time after their construction or purchase, or for the purpose of going to or from repairs in yards outside the Black Sea. While a southbound passage of a Russian submarine is very rare, it is has happened before. Russian Kilo-class submarine Alrosa (B-871) suffered an engine fire in 2009 and had to go to the Kronshtadt port near St. Petersburg for extensive repairs. On its way to the Baltic Sea, Alrosa took part in NATO’s largest submarine rescue exercise, Bold Monarch 2011, off the coast of Spain. In the next few days, there should be more clarity on why Krasnodar exited the Black Sea, but the transit does raise questions. If Krasnodar left the Black Sea for repairs, then this passage is in accordance with the provisions of the convention. However, that would mean that either the submarine has suffered some undisclosed damage beyond what the Russian Navy could repair locally, or the Russian Navy cannot provide regular overhauls of its submarines in the Black Sea. If the submarine, however, joins the Russian Mediterranean Naval Detachment and conducts military operations like the other two submarines in the region, then it could be considered a breach of the Montreux Convention that could prompt a round of political and diplomatic confrontations. The Black Sea Fleet has six Improved Kilo-class and one Kilo-class submarines in its roster. Only four of the Improved Kilo-class submarines are actually deployed to the Black Sea. The remaining two are stationed in the Mediterranean and supported by the Russian naval base in Tartus, Syria, since 2017. Krasnodar has been deployed to the Black Sea since early August 2017. The Improved Kilo class has six 533mm torpedo tubes and carries a combination of up to 18 torpedoes and SS-N-27 anti-ship and Kalibr land-attack missiles. Cem Devrim Yaylalı is an Istanbul based ship spotter and warship enthusiast. His photos have been published in Combat Fleets of the World and in Proceedings.